I’ve always loved eau de cologne. There’s nothing like the exhilarating zing of citrus to start your day, especially in sultry weather. 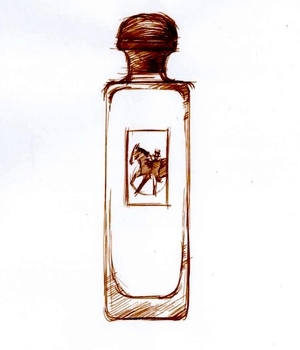 The classic cologne such as 4711 Kölnisch Wasser, with its mix of citrus fruits, lavender, rosemary and neroli oil, is a well-nigh perfect (if all-too-evanescent) formulation, but over the years many perfumers have tried their hand at adding their own individual twist, with greater or lesser success. At Guerlain, for example, each generation of perfumers has created their own cologne, and the brand’s range of Les Eaux includes some wonderful reinterpretations such as Jacques Guerlain’s Eau de Fleurs de Cédrat from 1920, or current perfumer Thierry Wasser’s delicious Cologne de Parfumeur from 2010, which adds modern musks and a touch of cedar to the formula. 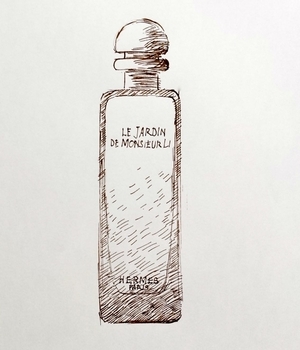 Hermès launched its first eau de cologne in 1979, with Françoise Caron’s superb Eau de Cologne d’Hermès, which was renamed Eau d’Orange Verte in 1997. For me it’s up there with Dior’s Eau Sauvage and Guerlain’s Vetiver as one of the greatest men’s perfumes around, and I’d expect that it remains their best-selling cologne. 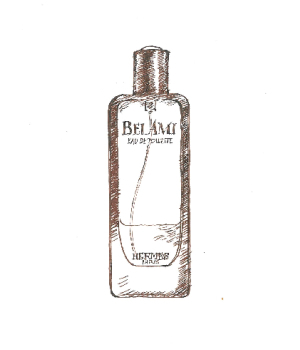 In 2009, though, Jean-Claude Ellena started expanding the range, with Eau de Gentiane Blanche and Eau de Pamplemousse Rose, followed in 2013 by Eau de Narcisse Bleue and Eau de Mandarine Ambrée. Hermès released two more colognes in 2016, marking the handover between Jean-Claude Ellena and his successor as in-house perfumer, Christine Nagel. Ellena’s Eau de Neroli Dorée is a superb celebration of the scent of orange blossom, while Nagel’s Eau de Rhubarbe Ecarlate is fruity and great fun. Her latest addition to the range is Eau de Citron Noir, which takes lime rather than lemon as its starting point. And not just any lime: the black lime of its name refers to the charcoal-black sun-dried limes you can buy in Oman, where they’re ground up and used as a spice. Nagel credits my fellow perfume blogger Persolaise for introducing her to this ingredient, which shows how important good blogs have become for the industry itself. Black limes give an earthy, rather sour taste to food, and lack the sweetness of fresh limes – but they also have a touch of smokiness, which Nagel has tried to recapture in her cologne. As a fan of colognes in general and lime in particular, Citron Noir should be right up my street. And it is – at least to start with. As with most colognes, its initial, zesty burst of citrus quickly fades away, to be followed by Nagel’s recreation of the unusual fresh-but-smoky scent of black lime, which still (to me at least) has a bit of fruitiness about it. Unfortunately that’s where I get off, if I can put it that way: on my skin the fruitiness seems to turn slightly sour after a while, and that’s not what I’m looking for in a cologne. On the other hand it makes a fantastically invigorating shower gel, since its initial lime freshness has no time to disappear. In spring 2016, after ten years as Hermès’ in-house ‘nose’, Jean-Claude Ellena handed over the (no doubt luxuriously designed) reins to the Swiss-Italian perfumer Christine Nagel. Hermès celebrated the handover with two new additions to its Colognes range, one by Ellena and the other by Nagel – her first perfume for the brand. Ellena’s Eau de Néroli Doré is a fittingly sumptuous sign-off from this much-lauded perfumer, using high concentrations of neroli oil, extracted from the flowers of the Seville orange tree. It’s as refined and elegant as the man himself, and like most of his fragrances it also contains an ingredient more often associated with food. In this case it’s saffron, which (to my nose at least) seems to give the perfume an added touch of smoothness and sheen. Christine Nagel’s Eau de Rhubarbe Eclarate, by contrast, is an exercise in sheer vivacity and ebullience, using the smell of freshly-cut rhubarb and extending its longevity with the soft, refined scent of modern synthetic musks. It’s fruity and sweet and instantly appealing, more emotional than intellectual, but certainly great fun. 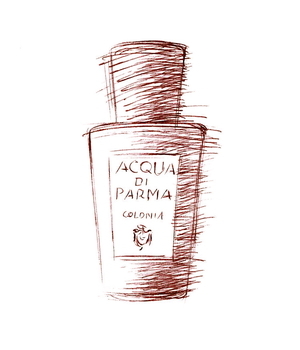 With its ruby-red bottle it’s a real pick-me-up at the start of the day; save the golden Eau de Neroli Doré for later. If that’s true I think it’s a shame, since English gardens are some of the most varied and imaginative in the world, and I’d have loved to get the chance to show Ellena the all-green garden at Rousham, say, or the vast yew terraces of Powis Castle. Then again, perhaps he simply fancied travelling somewhere more exotic than could be reached within the limits of a day-trip on the Eurostar. Either way, Chinese gardens, with their long and literary history, offer rich material for a creative perfumer, and it can’t hurt that China is a vast and expanding market for luxury brands, as attested by Hermès’ sumptuous new store in Shanghai. Though the Monsieur Li of the title is imaginary, Ellena’s visits to Chinese gardens were made with the Chinese painter Li Xin, who moved from Beijing to Paris in 2002 and whose work forms a perfect counterpoint to Ellena’s: subtly sophisticated abstract ‘landscapes’ in washes of ink on creased rice-paper, one of which decorates the box for Le Jardin de Monsieur Li. If you’re feeling slightly queasy by now join the club, though this is par for the course for perfume PR. It probably sounds just fine in French, but high-flown purple prose translates terribly into Anglo-Saxon English, and I do wish they wouldn’t bother. And can you smell this in the perfume itself? The answer is yes and no. I can certainly smell lemon and something like kumquats – a sweet, slightly strawberryish smell, though far less sweet than the delirious strawberry-kumquat scent of Black XS for Men from Paco Rabanne. I get a hint of jasmine, but it’s subtle and restrained enough for Le Jardin de Monsieur Li to be equally intriguing on a woman or a man. It smells quite green and fresh to me as well, which I guess suggests the giant bamboo; Hermès describe the perfume’s ‘key notes’ as ‘Jean-Claude Ellena’s personal evocation of Vegetal Jasmine, Mint, Kumquat and Sap’. What I like about this perfume most might drive other people mad, which is that I can’t quite put my finger on what it smells of, but to me that’s intriguing enough to make me want to keep wearing it. 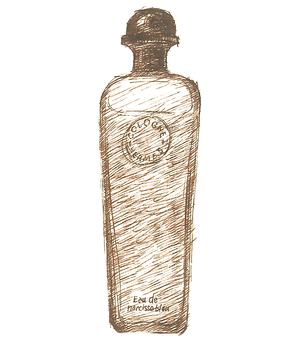 And though it’s subtle and restrained, Le Jardin de Monsieur Li has a staying power that some of Ellena’s other perfumes lack – worth noting when a 100ml bottle costs £84. Still, it’s a lovely scent and a beautiful bottle too, in heavy glass suffused by a pale shade of imperial yellow that delicately deepens from top to bottom. 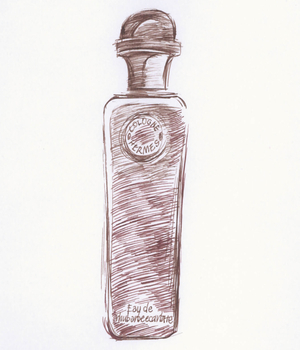 Like several other major perfume and fashion brands, Hermès has, in recent years, organised its range of perfumes into a number of different groups. I’m guessing that this is partly to help them refine their message for different segments of the market, but I also wonder whether it has something to do with their in-house perfumer, Jean-Claude Ellena, trying to bring order to a rather disparate collection of scents, in the way that a newly appointed curator might attempt to impose order on a rather muddled art collection. 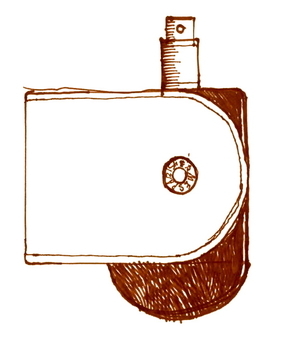 Whether intentionally or not, the groups have been divided in a way that reflects the gradual shift away from gendered to genderless scents, with most of the pre-Ellena perfumes being assigned, in the old-fashioned way, to either women or men (men getting Bel Ami, Equipage and Terre d’Hermès). By contrast most of the more recent scents are categorised by type, not gender, and described as ‘for sharing’ – currently five in Les Colognes collection, four in Les Jardins and eleven in the much more expensive Hermessences range, leaving Eau d’Hermès and Voyage d’Hermès standing on their own. I’m guessing that the mass-market scents – Voyage and Terre d’Hermès – bring in most of the cash, but what seems to interest Hermès most (and, by extension, Jean-Claude Ellena) are the Hermessences: there are already more of them than there are in any other range, and they’re the only fragrances for which the company does its own in-house PR. They’re also almost twice the price of other Hermès scents: £161 for a 100ml eau-de-toilette as opposed to £73-£80 for a 100ml eau-de-toilette from any of the other groups. Given how much they cost, you’d expect the Hermessences to be more unusual and have more staying-power than Hermès’ other perfumes, and at least in the case of Vétiver Tonka, that seems to be true. One often-repeated criticism of Jean-Claude Ellena is that the perfumes he creates tend towards the light and evanescent – delicate compositions that disappear all too quickly on the skin. Some people might regard that as a good thing, but as a value-for-money Yorkshireman I want to get some bang for my buck. Vétiver Tonka certainly lasts, so that’s a good start. 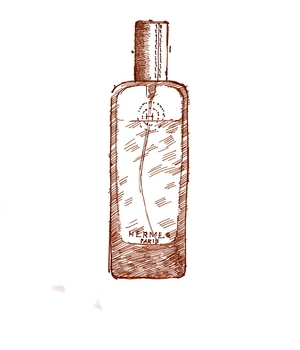 It’s also unusual, which for me is another plus – so many perfumes smell almost identical these days. But unusual doesn’t always mean attractive, or even wearable – just smell the amazing Bulgari Black, which is a brilliant scent, but also almost unwearable, at least outside a nightclub. Vétiver Tonka certainly isn’t in that league, but nor does it fit into an easily recognisable ‘normal’ category of scents. Vetiver, of course, is a classic ingredient of many perfumes aimed at men: extracted from the roots of a tropical grass, it smells earthy and dry, but also fresh; it has the added advantage of being extremely long-lasting, and it can enhance the longevity of other ingredients too. The vetiver that Jean-Claude Ellena has used here, though, is a smoother, less rough-edged extract, which makes the perfume smell perhaps a little more feminine than I’d normally expect. Tonka – the perfume ingredient, not the toy company – comes from the beans of the cumaru tree, Dipteryx odorata, which grows in Central America and, like laburnum and wisteria, belongs in the pea family. These beans yield coumarin, a chemical that was often used as a cheaper substitute for vanilla; coumarin also smells a bit like cinnamon, almonds or cloves, all of which I get traces of in Vétiver Tonka. In many ways this is a perfume that does what it says on the tin, for if you can imagine the earthy smell of vetiver mixed with the foody smell of tonka (which many people find slightly chocolatey, probably because of its association with chocolate), then that’s pretty much how Vétiver Tonka smells. 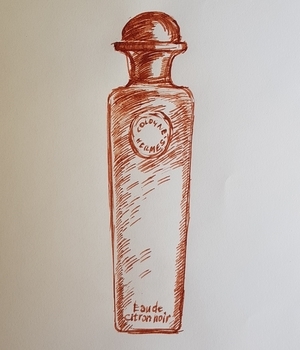 The vetiver helps it last all day, but what I mostly smell is the tonka, doubtless blended with many other things – there’s a gentle nuttiness, a bit like rum or sherry, or even a kitchen in the middle of baking day. When I asked my mum what she thought of it she said, ‘It’s a very nice smell, but it doesn’t really smell like a perfume,’ and I think that pretty much sums it up. Not something you’d necessarily want to adopt as a signature scent, but a quality perfume to try if you fancy smelling a bit out of the ordinary. It also comes in a very nice Hermès box (with a rather cheap-looking cloth bag inside), and the clear-glass bottle – cleverly suffused with pale green – is satisfyingly chunky, with a stitched-leather cap, though whether all that makes it £161 I’m still not sure.